While NASA is researching 3D-printed habitats for the Moon and Mars, the European Space Agency (ESA) has tapped Skidmore, Owings & Merrill (SOM) and the Massachusetts Institute of Technology (MIT) to envision a theoretical lunar city. The Moon Village, which SOM will masterplan, design, and engineer, not only reflects the collaborative nature of the ESA’s mission but also lays out a plan—and base of operations—for space exploration past 2050. As Israel prepares to potentially land the first privately-funded spacecraft on the Moon, the Moon Village would take a decidedly more multinational approach and could be used by future science missions or even space tourists. Set up along the rim of the Shackleton crater on the Moon’s south pole, which receives continuous sunlight for nearly all of the lunar year, the Moon Village would rely on solar power to generate electricity. The possibility of water ice inside the crater itself, which is always shadowed, would provide the colony with another potential resource to tap. “The project presents a completely new challenge for the field of architectural design,” said SOM Design Partner Colin Koop. “The Moon Village must be able to sustain human life in an otherwise uninhabitable setting. We have to consider problems that no one would think about on Earth, like radiation protection, pressure differentials, and how to provide breathable air.” How did SOM design around those tight constraints? The village’s modules would all inflate or deflate depending on their programmatic needs. Each structure would be about three-to-four stories tall and contain living quarters, environmental controls, life support systems, and workspaces. Eventually, 3D-printed regolith shells could protect the modules from radiation, fluctuations in temperature (although Shackleton crater has a more consistent temperature than other parts of the Moon), and dust. Modules would be clustered and linked through pressurized tunnels to provide easy transportation between them. A series of in-situ resource utilization (ISRU) experiments could help determine how to best use the Moon’s natural resources. Oxygen and possibly rocket fuel could be generated from the nearby ice, and food could be conceivably grown in the environment. 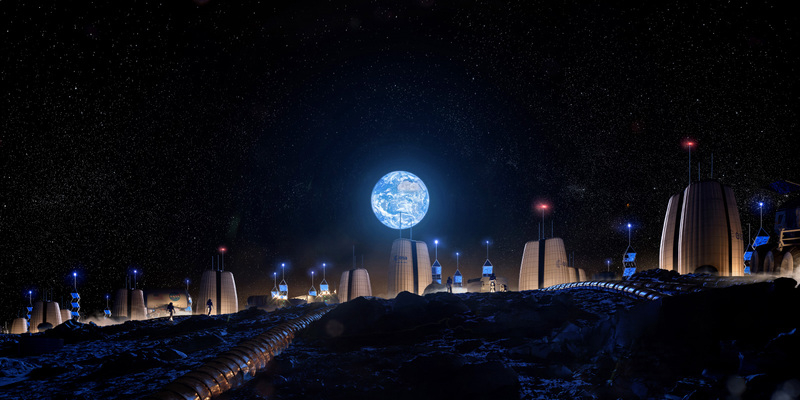 The Moon Village has been envisioned as a three-stage development that would eventually create a long-term, sustainable Moon community. The first phase, the master plan revealed on April 9, used near-future technology; but, as Fast Company pointed out, the Moon Village would still be reliant on international cooperation, and that’s far from assured right now. JPMorgan Chase, the largest bank and financial services company in the United States, filed permits last month to demolish its massive headquarters on Park Avenue to build an even bigger, 70-story tower on the same site for its ever-growing number of employees, according to CityRealty. The destruction of the 52-floor, 1.5-million-square-foot tower will mark the tallest planned demolition in history, surpassing that of New York City’s Singer and Deutsche Bank Buildings. The 2.5-million-square-foot replacement will be the first skyscraper to rise up after the 2017 rezoning of Midtown East, which made a 73-block area surrounding Grand Central Terminal available to taller skyscrapers. 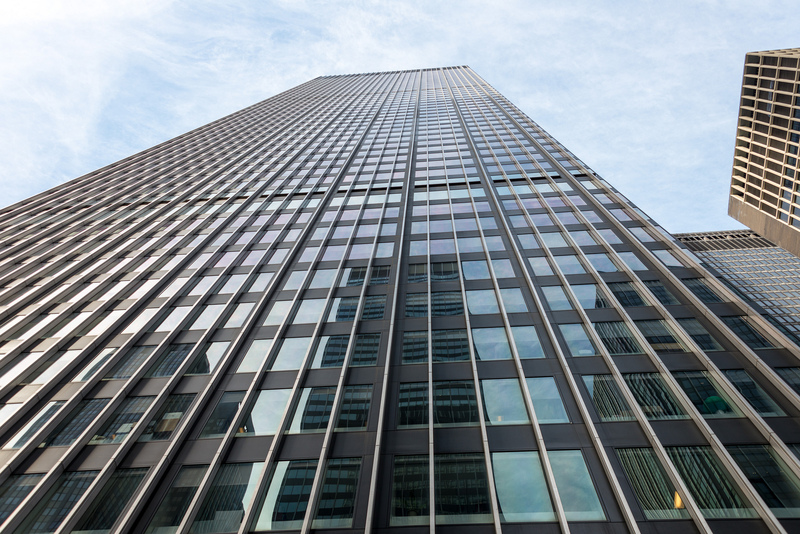 JPMorgan Chase has long been dissatisfied with its outdated headquarters at 270 Park Avenue, with over 6,000 of its employees jam-packed into a building meant for only 3,500 people. While the modernist tower was designed by Skidmore, Owings & Merrill’s esteemed Natalie Griffin de Blois, a female pioneer in the architectural field, it is not protected by landmark status from demolition. Its soaring replacement will be more open and flexible with 20 additional floors where employees will have an extra one million square feet of office space. JPMorgan Chase has slated the demolition work for early 2019, and a construction elevator can already be seen alongside the building. Once the new structure is completed in 2024, it will be one of the tallest buildings in New York City and one of the largest office buildings in the northern hemisphere. The design team, led by Foster + Partners, will seek LEED certification, and the project anticipates to introduce over 8,000 construction jobs to the city. In the meantime, JPMorgan Chase has negotiated leases at nearby buildings—including 237, 245, and 277 Park Avenue—for the workers who will soon be displaced due to the impending wreckage. The first International Style hotel in America may not fall into disrepair or have its iconic exterior transformed after all. After a 5-1 vote in favor of a local landmark designation for the Terrace Plaza Hotel by the Cincinnati Historic Conservation Board on February 25, the designation will advance to the City Planning Commission, and finally the City Council. Completed in 1948, the 20-story redbrick tower was the first hotel project from SOM. 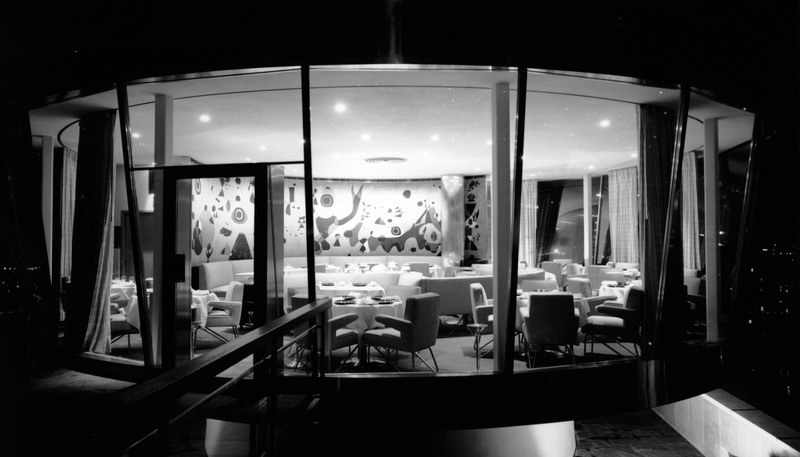 Natalie de Blois led the design team, which was responsible for everything from the interiors, to the staff uniforms, down to the ashtrays and matchbooks. The building’s most distinctive features are its windowless seven-story base, which projects an imposing presence on the street, and its circular steel-and-glass Gourmet Restaurant space on the roof. As photographer Phil Armstrong detailed in his historical documentation, much of the building’s interior has fallen into ruins. The building has unfortunately sat vacant for a decade, and plans began floating around from a prospective developer at the beginning of last year to strip the hotel’s monolithic base and replace it with a glass box. It should be noted that the building was included on the National Register of Historic Places on August 21, 2017, according to Docomomo U.S., but that this doesn’t provide the level of protection that a local designation affords. The hotel was sold in August of 2018 to the New York–based real estate investment firm JNY Capital. JNY nearly immediately faced the threat of a lawsuit from the city over its refusal to make necessary repairs to the building after ground-floor tenant complaints—and after a chunk of the building dislodged and smashed a parked car below. JNY has been looking into adding windows to the tower’s first seven floors, which it claims is necessary to attract office tenants following a redevelopment but would destroy the building’s historical significance. Now, that plan may be on hold as a landmark designation may be looming; the final decision should be handed down by the City Council sometime in the next six months. During the Cincinnati Historic Conservation Board’s meeting, the economic feasibility of redeveloping the building while remaining true to its legacy was discussed, but the board’s members ultimately decided that it was beyond the purview of their discussion. JNY remains opposed to the designation and has stated it has no plans to demolish the hotel or its towering facade. Four blocks of Manhattan’s Far West Side were rezoned 14 years ago for New York's ambitious 2012 Olympic bid. After a failed attempt to secure the games, the parcel of land was awarded in 2008 to real estate giant Related Companies. Through a public-private partnership in which Related would oversee the design, construction, and long-term maintenance of the site, the group began creating what's now the largest private development in the history of the United States. 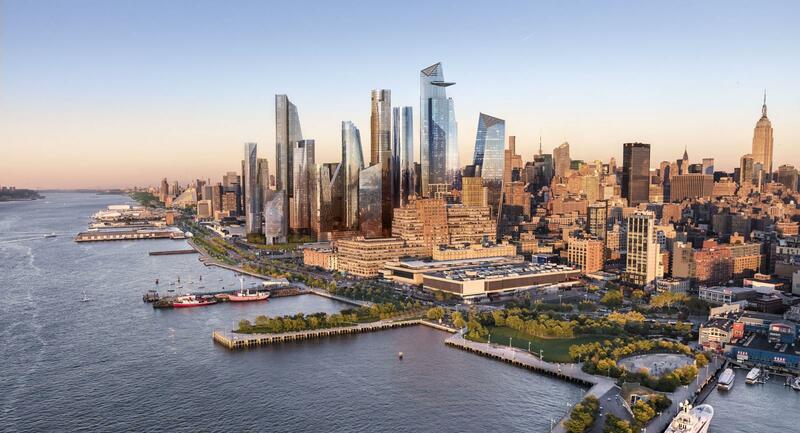 Set atop a cluster of rail yards between 10th and 11th avenues, the first phase of the multibillion-dollar megaproject known as Hudson Yards is set to open on March 15, when a cohort of towers and parkland previously inaccessible to the public will be unveiled. Ahead of the much-anticipated launch date, here’s a brief look at what’s already opened and what’s coming online this spring. 10 Hudson Yards Designed by Kohn Pedersen Fox Associates (KPF), this 895-foot-tall office tower was the first structure completed on-site in May of 2016 and features 1.8 million square feet of commercial space. It boasts tenants such as Coach, L’Oréal, Sidewalk Labs, VaynerMedia, and Boston Consulting Group, among others. A Spanish food hall by José Andrés will also be located in the building. 15 Hudson Yards Rising 917 feet in the sky, this residential tower will offer 285 luxury apartments and 107 affordable rentals come March. The skinny skyscraper was designed by Diller Scofidio + Renfro (DS+R) as lead architect and Rockwell Group as lead interior architect. 30 Hudson Yards This commercial tower, also designed by KPF is the tallest in Hudson Yards, stretching 1,296 feet in the air, and is set to open in March. It features the city’s highest open-air observation deck, which will be open to the public in 2020. Major media groups such as HBO, CNN, Turner Broadcasting, Time Warner, and Wells Fargo Securities, are set to move in this March. 35 Hudson Yards Also opening this spring, this mixed-use supertall tower was designed by David Childs of Skidmore, Owings + Merrill. It will house 143 condominiums, as well an Equinox Club at the base of its 92 floors. 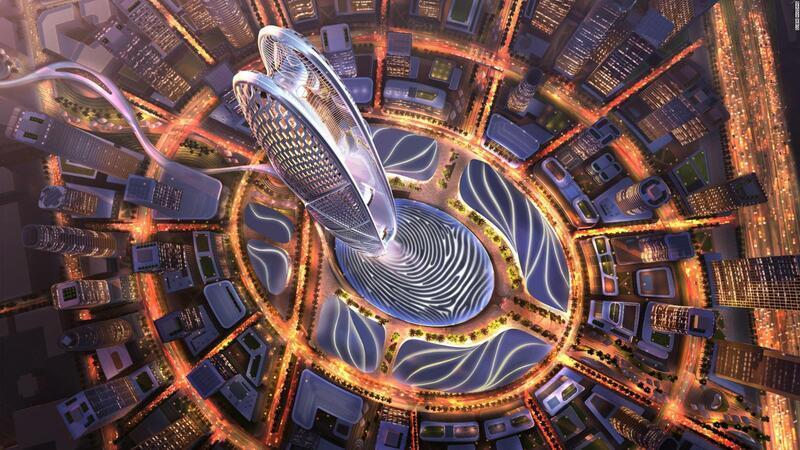 A branded hotel by the luxury fitness company will also open inside the structure. 55 Hudson Yards KPF worked alongside Kevin Roche John Dinkeloo and Associates to design this boxy, 780-foot office structure. Completed last year, it's already opened to tenants, serving as the headquarters of several law firms and financial groups. Vessel/New York’s Staircase Heatherwick Studio’s monumental work, known now as New York’s Staircase or Vessel, was commissioned to become the development’s signature work of art. As the centerpiece of Hudson Yards’ five-acre public park, designed by Nelson Byrd Woltz Landscape Architects, the spiraling, copper-clad work stands 150 feet tall and weaves 2,500 steps throughout its structure. It will open to visitors starting in March. The Shops and Restaurants a.k.a. 20 Hudson Yards This seven-story structure, designed by Elkus Manfredi Architects, will contain 25 fast-casual dining options and restaurants helmed by famous chefs like Thomas Keller and David Chang. The one-million-square-foot building will also feature over 100 luxury shops and an immersive exhibition space by Snarkitecture called Snark Park. The Shed, a.k.a the Bloomberg Building This 200,000-square-foot structure features a retractable outer shell designed to open and enclose a year-round exhibition space and performing arts venue. Also designed by DS+R in collaboration with Rockwell Group, the structure sits at the base of 15 Hudson Yards and will serve as the city’s newest cultural center. The project will open on April 5. The third time’s the charm for engineers NV5 and preservation consultants at Higgins Quasebarth & Partners. On February 5, the team, this time joined by stone conservation expert George Wheeler, successfully argued before New York’s Landmarks Preservation Commission (LPC) for permission to swap the stone out at the Manhattan plaza of the landmarked 140 Broadway building. 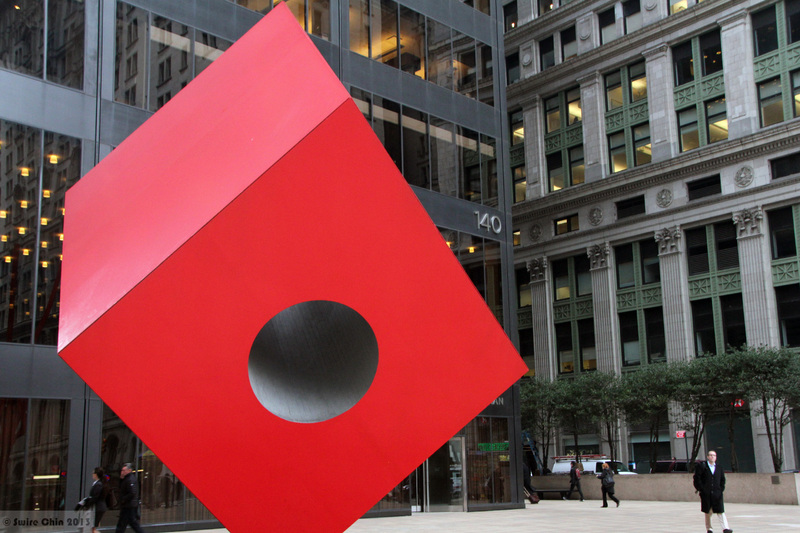 The former Marine Midland Building, an international-style office tower designed by Gordon Bunshaft and SOM in 1967, is distinctive for how its imposing black massing “floats” above a plaza of what was originally travertine surrounding Isamu Noguchi’s distinctive Red Cube. The travertine pavers were replaced with pink granite in a 1999 renovation, and the project team went before the LPC to propose a new shade of granite closer to the original stone. That drew the ire of preservationists and some of the commissioners, who asked why travertine wasn’t being used instead. Much of the presentation (available here) from 140 Broadway’s ownership and project team dealt with that question. The pitch was that granite, with a compressive strength of nearly three times that of travertine, would be a much more durable replacement. Travertine’s pockmarked nature also renders it particularly vulnerable to freeze-thaw cracking and salt blooms because water easily impregnates the porous stone. The team maintained that five-inch-thick travertine pavers would be needed to meet all of their aesthetic and safety concerns, and that because of the voids under the plaza, the pavers can only be two-inches thick. While Bunshaft had chosen travertine to evoke the feeling of a Roman plaza, the presentation made it clear that New York’s climate was much harsher than Rome’s. The comprehensive analysis was done after the ownership team’s prior two LPC presentations in March and November of 2018. Commissioners had previously declined to vote on the proposed granite replacements and suggested that NV5 and Higgins Quasebarth look further into travertine. As preservationist Theodore Grunewald noted, the reason 140 Broadway’s plaza was before the LPC was that the granite installed in 1999 was also failing and that there was no guarantee that it wouldn’t happen again. Travertine plazas are still in use at Manhattan’s W.R. Grace Building and Solow Tower Building, both designed by Bunshaft, but the project team noted that the drainage systems and sloped “skirt” at the base of each tower helped facilitate the quick movement of water off of the vulnerable stone beneath. Ultimately the commissioners voted to approve the use of Tudor Gold Granite, although there were some concerns about the need to choose a color closer to the original travertine. Commissioner Adi Shamir-Baron, the only nay vote at the hearing, noted that the commission’s role was to preserve moments in time, regardless of viability, and not just upgrade the city’s properties with "space-age materials." 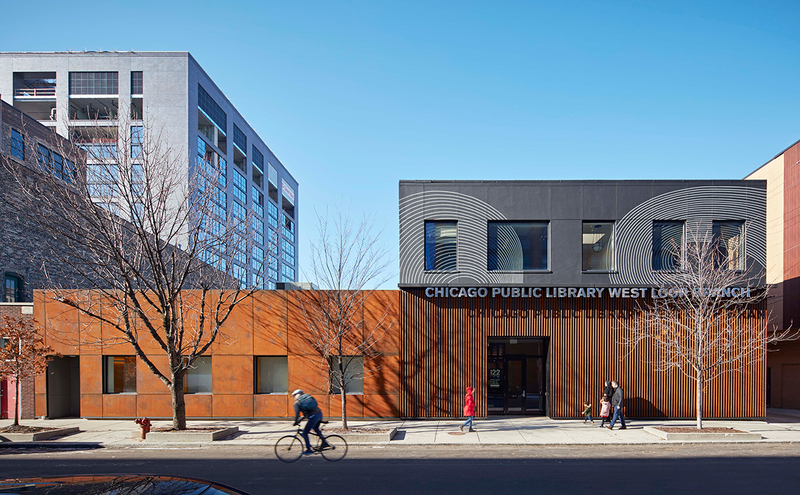 In an old Harpo Productions building in Chicago's West Loop, Skidmore, Owings & Merrill (SOM) has designed a new branch for the Chicago Public Library, the first outpost of the system in the neighborhood. 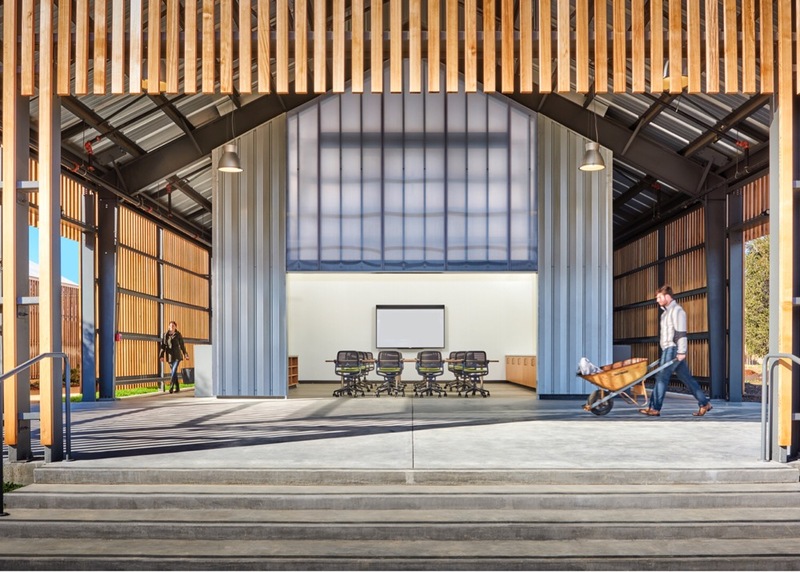 The two-story, 16,500-square-foot building unites two older structures into a single cultural center for the area. The interior design takes its cues from the neighborhood's historic warehouses and stripped back existing partitions and finishes to reveal the brick and timber structure. Shelves were kept low so that spaces could feel and sight lines could be maintained. Brian Lee, design partner at SOM said in a statement: "The unique architecture and scale of the West Loop reflects a vital part of Chicago’s industrial history, while the growing residential and mixed-use character of the neighborhood points to an exciting vision of the city’s future." A sweeping graphic runs along the library's walls representing "story lines" from classic children's books and novels that visitors are invited to follow. Coloring throughout is golden and warm, playing off the reddish tones in the exposed brick and wood. Wall text highlights the words of global poets and authors that the designers selected. In November 2018, news first broke of the five-firm shortlist competing to design the $8.7 billion Terminal 2 at Chicago’s O’Hare International Airport. The star-studded list held both international and local firms, and today, Chicago city officials have made public designs for each team’s proposal. Chicagoans and frequent fliers have until January 23 to vote for their favorite designs and offer feedback, here. The O’Hare 21 expansion, which will expand O’Hare from 5.5 million square feet to 8.9 million square feet, is a pet project of outgoing mayor Rahm Emanuel. 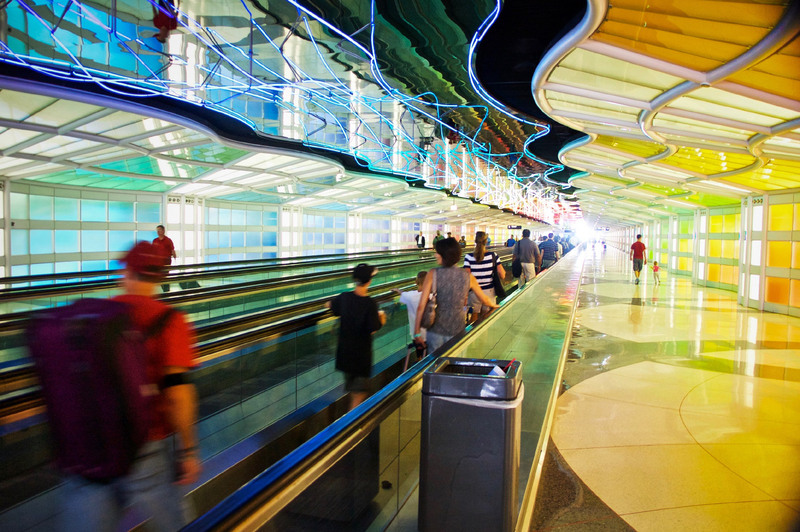 O’Hare currently serves nearly 80 million travelers a year, and with demand projected to grow, the extant Terminal 2 (built in 1963) needs to be expanded. 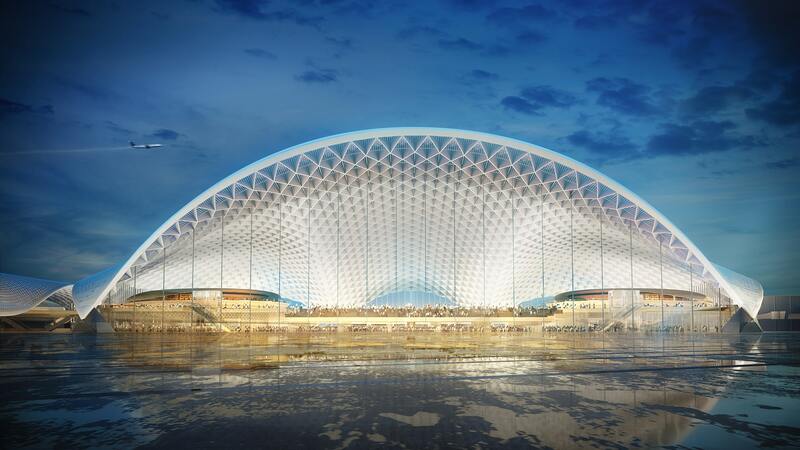 The team of Colorado’s Fentress Architects, engineering and architecture firm EXP, Brook Architecture, and Garza Architects have proposed an undulating terminal with a ribbon-like canopy, held up by slender, full-length columns. A split in the terminal’s massing would allow natural light into the center of the building, a necessity given that the team has stacked more floors into its terminal than the other four. Foster + Partners has been working with local firms Epstein and JGMA, and have produced a dramatically curved, cave-like terminal fronted by an enormous wall of glass. Foster’s terminal resembles a draped piece of fabric swaying in the wind that splits into three separate arched halls at the rear but opens to what they’ve dubbed a “theater of aviation” at the tarmac. The use of a crisscrossing truss system topped with glass creates a coffered ceiling effect while also allowing in natural light. From the renderings, it appears that the terminal’s interior will be clad in a warm wood finish. Studio ORD Joint Venture Partners, the team formed by Chicago’s Studio Gang, Corgan Associates, Solomon Cordwell Buenz, and STL Architects, was heavily influenced by themes of convergence and confluence. Three curves join in the middle to carve out space for a massive central skylight. The roof of each curve, formed from ribs that extend into the terminal’s interior, tent in the center; it appears the underside of each will be clad in timber. The team has described their proposal as one that’s layered but easy to navigate. Skidmore, Owings & Merrill (SOM), who have partnered with Ross Barney Architects and Arup, are proposing ORD, from a shortening of Orchard Field, the original name of O’Hare (unrelated to Studio ORD above). Although their plan is squarer than the others, the SOM team has also designed an undulating roof supported by coffered timber trusses. The roof would cantilever out over the terminal’s tall glass walls, and according to the video, ample landscaping that references Illinois’s nickname as “the Prairie State.” Intriguingly, the terminal would also include enclosed outdoor plazas, complete with tree-strung hammocks, for passengers to relax in. Last but certainly not least, Santiago Calatrava and local firm HKS have presented the most ambitious of the five proposals (though it fits quite snugly within Calatrava’s oeuvre). Resembling a ship’s prow, the glass facade bulges in the center before terminating at a sharp point. Inside, large, unbroken spans are supported by Calatrava’s signature structural “ribs” to create a soaring interior space. The team has also proposed turning the existing parking area to the terminal’s rear into a landscaped “hotel, retail, and business complex,” though there’s no telling how much that would add to the budget. ﻿ The city and Chicago Department of Aviation are being pushed to make a decision before Mayor Emanuel departs in May of this year, and the project is expected to finish in 2026. Models of each team’s submission can be viewed at the Chicago Architecture Center until January 31, and Terminal 2 will be displaying the new designs digitally until the 31st as well. Chicago’s unbuilt Lincoln Yards mega-development will no longer include a soccer stadium and entertainment district. Under pressure from constituents, Alderman Brian Hopkins of Chicago’s 2nd Ward has rejected developer Sterling Bay’s proposal to include a 20,000 seat United Soccer League stadium, as well as a series of large Live Nation–run entertainment venues. Live Nation will divest itself from the development, as will the United Soccer League and Chicago Cubs owner Tom Ricketts, who is the majority owner of a Chicago franchise. Alderman Hopkins has called for Sterling Bay to retool the project to bring more open space to the development in place of the stadium and venues, and bring a variety of smaller, scattered venues through the site, as well as restaurants and theaters. The public has yet to hear this proposal, despite Lincoln Yards' presence on the January 24 Chicago Planning Commission meeting agenda and confirmation from Mayor Rahm Emanuel that the project will "move forward on a balanced path," Crain's Chicago Business reported. Expected to cost upwards of $6 million dollars, Lincoln Yards will transform nearly 55 acres of former industrial land along the Chicago River into a dense cluster of retail, office, and residential development, delivering a planned 5,000 residential units, 500 hotel rooms, a mile of new riverwalk, and an extension to the 606. 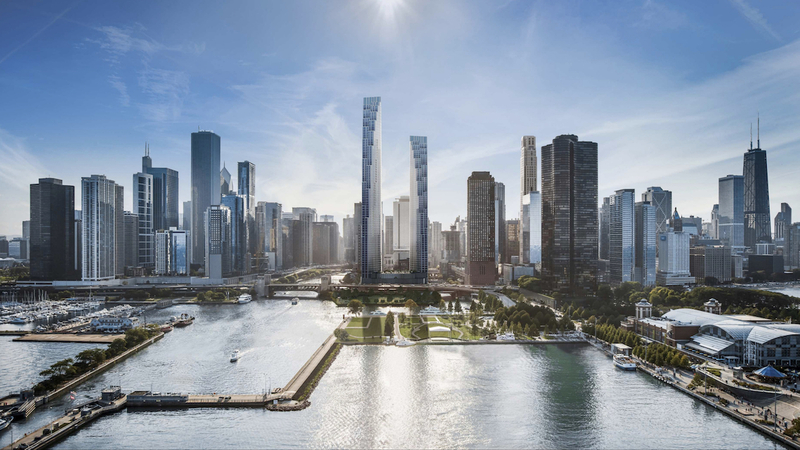 Designed by SOM, the project is slated to include multiple skyscrapers reaching a height of up to 650 feet, making the overall height of the development as tall as some structures in the Loop. This isn’t the first time Sterling Bay has had to trim its plans for Lincoln Yards; community input dictated a decrease in the maximum height of the high-rise towers and an increase in publicly-accessible open space in response to a community meeting in November. The move to ax Live Nation from the plan had advocates of The Hideout feeling cautiously optimistic as the Live Nation–run spaces could have threatened the independent venue and provided competition, despite Sterling Bay's commitment to keeping The Hideout a component of the Lincoln Yards plan. While Sterling Bay has agreed to provide opportunities for independent music operators to participate, concerns remain. 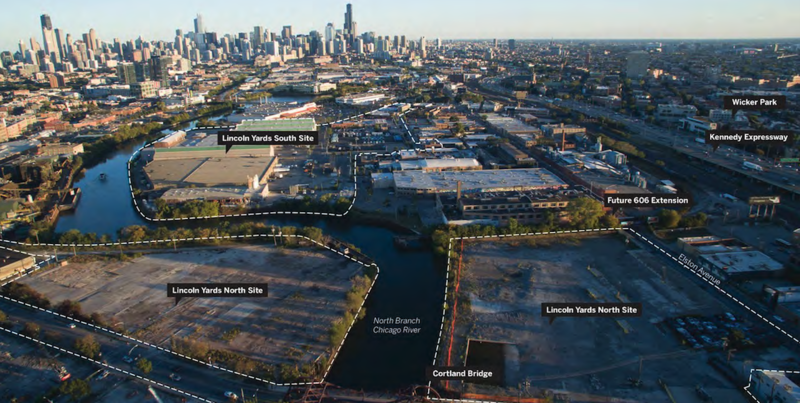 The City of Chicago introduced the Cortland/Chicago River Tax Increment Financing (TIF) district in November, which encompasses the entirety of the Lincoln Yards site. As Sterling Bay would be the primary property owner, it would be allowed to pay for the project and its future improvements through TIF funds, raising questions of the appropriateness of the new district, as TIF is intended to revive struggling neighborhoods. Members of the City Council Progressive Caucus have been advocating for a measure that would allow the city to provide TIF funds only to projects that cannot be completed without them. Sterling Bay has also yet to address how many of the residential units will be considered affordable, or the demand the project will place on new schools. While some concerns regarding infrastructure and transportation have been addressed, area residents remain concerned about traffic and congestion, as well as the availability and equitability of public transportation. Five finalists have been selected in the competition to design the new $8.7 billion expansion of Chicago’s O’Hare International Airport, narrowing the field from the longlist of 12 released in September. The shortlist features a mix of local names and international studios: Skidmore, Owings & Merrill (SOM), Santiago Calatrava, Foster + Partners, Chicago’s own Studio Gang, and Colorado’s Fentress Architects. The expansion, part of a modernization initiative dubbed O’Hare 21 by outgoing mayor Rahm Emanuel, will totally replace the V-shaped Terminal 2, a holdover from the airport’s opening in 1944. O’Hare is one of the busiest airports in the world and currently services nearly 80 million passengers a year, and O’Hare 21 will expand the airport’s footprint from 5.5 million square feet to 8.9 million square feet. Such a large project means that these teams likely won’t be going it alone. Fentress is joined by Brook Architecture, Garza Architects, and engineering and architecture firm EXP, Calatrava will be working with local firm HKS, while Foster + Partners has teamed up with local firms Epstein and JGMA, and Studio Gang has partnered with Corgan Associates, Solomon Cordwell Buenz, and STL Architects. SOM will also be joined by Ross Barney Architects and Arup in their bid. After a review by the Department of Aviation, one team will be chosen to design the Terminal 2–replacing O’Hare Global Terminal, while a second will be tapped to design the airport’s two new satellite concourses. Perhaps what’s most interesting is who didn’t make the cut. BIG was knocked out, as were HOK and Gensler. Even Helmut Jahn, a Chicago wunderkind who designed O’Hare’s Terminal 1 in 1986, wasn’t chosen. Now that the shortlist has been chosen, an official selection committee of business, civic, and transportation leaders from Chicago will choose who ultimately gets to design the new facilities (with local architecture firms and cultural institutions providing technical support). Mayor Emanuel is pushing the city to choose before he leaves in May of 2019, and if all goes as planned, the multi-phase O’Hare 21 should be complete by 2026.